FUR DIE STADT (for the city) Pigeons foraging in cold snow of St Petersburg this past winter migrate all the way to New York for spring. Anna Frants' multimedia installations of Russian city street pigeons scavenging for food have landed on both sides of the East River. 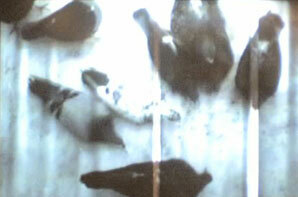 Undeterred by the bustling public street around them, Frants video/sound projections of feathered city inhabitants go about their business in the front window of Dam Stuhltrager Gallery in Brooklyn at the Chelsea Art Museum in Manhattan. Connecting life as an artist in Russia and in America, Frants' video is set in a frozen, harsh and unforgiving setting where occupants are filmed amidst routine of working hard to find and claim their daily bread. Among the crowd, one bird has notably different movements and it becomes clear he/she is sick or injured. Set to Beethoven's Sonata, the impeded pigeon is the weakest in the bunch but nonetheless uniquely different, and thus rises as the star.